Mt. Tamalpais (Mt. Tam) is one of the most scenic mountain sites in California. It is has unobstructed panoramic views of the Pacific Ocean, San Francisco, and the Bay and Delta waters. There are many popular hiking trails all around the mountain, and Stinson Beach is below. The Marin County Hang Gliding Association (MCHGA) has been designated by the State of California and the County of Marin Department of Parks and Recreation, through special use permits, to administer hang/paragliding activities on Mt. Tam. Mt. Tam is located north of San Francisco, between Mill Valley and Stinson Beach. There are three launches facing south to northwest (~2000 ft. MSL). 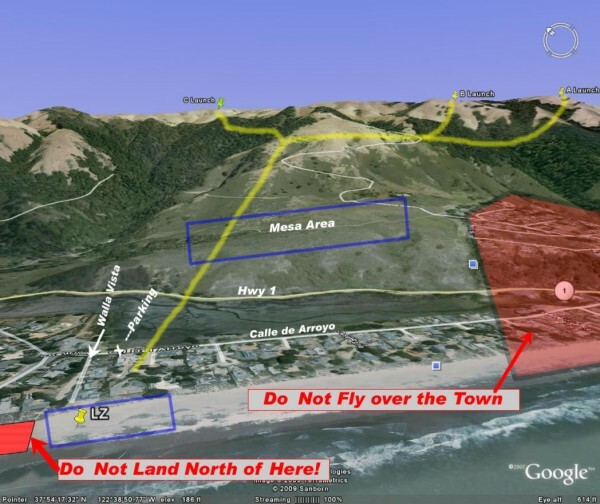 The landing zone is near the north end of Stinson Beach. Check a tide table for high tides; especially during the winter and spring. The best season for Mt. Tam is during winter and spring as the storms bring instability for good soaring conditions. The conditions can become extreme due to the Pacific to the west and the Delta to the east. ​WARNING: Funnel clouds and associated systems have developed rapidly after what seemed to be good starting conditions. ​Pilots are expected to uphold and enforce the flying rules established for the site. Any pilot errors made while flying, such as endangering other pilots, spectators, or destruction of government or private property, could result in the revocation of the County or State use permits, with consequent loss of Mt. Tamalpais as a flying site. Click here for a photo of the flying site, showing launches and landing area. On the mountain, stop any State Ranger vehicle for assistance or contact the Pan Toll Ranger Station at 415.388.2070. There is a public telephone there also. On the beach use the Stinson Beach Fire Department emergency number, 415.868.1616. Please remember that flying Mt. Tamalpais is our privilege - not our right. Use common sense and sound judgment. Fly safe!